This article describes how to start or stop an ECS instance. You can start an instance in the ECS console. When an instance starts successfully, it is in the Running status. Log on to the ECS Management console. Find the instance to be started and, in the Actions column, select More > Instance Status > Start. If you want to start multiple Stopped instances, select the required instances and then, under the instance list, click Start. Read and confirm you agree to the note displayed in the dialog box by clicking OK. The instance is in the Running status after it is started. To stop an instance is to shut it down. You can stop an ECS instance in the ECS console. When an instance stops successfully, it is in the Stopped status. Note Stopping an instance disrupts services. Exercise caution when performing this action. If you stop a (Subscription) instance before its billing cycle is completed, the bill for that cycle is not affected. If the auto-renewal service is activated, you are still billed for the stopped instance at the start of each new billing period. VPC: If the No Fees for Stopped Instances (VPC-Connected) feature is enabled, you can decide whether to continue being billed for the instance. However, you are still billed for other ECS-related resources. For more information, see no fees for stopped instances (VPC-Connected). If this feature is not enabled, billing continues after the instance is stopped. Classic network: A stopped instance still incurs fees. Billing stops only after you release the instance. The instance is in the Running status. Find the instance to be stopped and, in the Actions column, select More > Instance Status > Stop. If you want to stop multiple Running instances, select the required instances and then, under the instance list, click Stop. Subscription instance or classic network pay per volume instance: In the Stop Instance dialog box, select Stop or Force Stop, and then click OK. 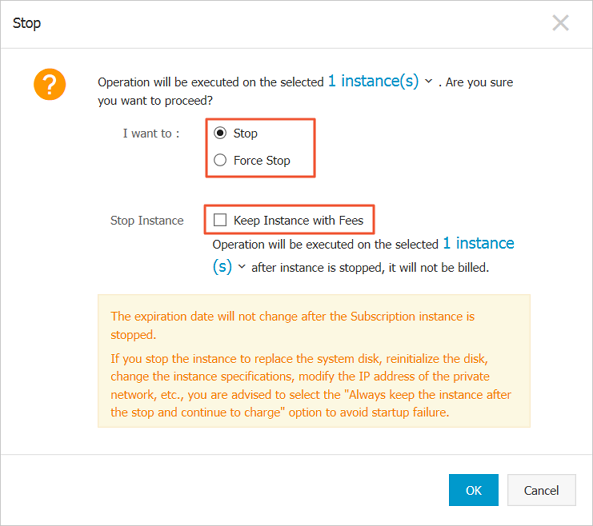 If the No Fees for Stopped Instances (VPC-Connected) feature is enabled, read the Notice, select Stop or Force Stop in the Stop Instance dialog box, select a mode (whether to keep the instance after stopping and continue charging), and then click OK. If the No Fees for Stopped Instances (VPC-Connected) feature is disabled, in the Stop Instance dialog box, select Stop or Force Stop. Note To disable the No Fees for Stopped Instances (VPC-Connected) feature, see no fees for stopped instances. Once the instance is successfully stopped, the instance enters the Stopped status. For a VPC-Connected Pay-As-You-Go instance, if you select not to keep the instance, Stop Instance, No Fees is shown in the instance list. Otherwise, Keep Instance, Fees Apply is shown. For other ECS instances, no information is shown.